What's vegan, cruelty-free, gives back to the community and is in love with the shape of you? LUSH! Roughly a month ago, my blogger friend, Sharmaine (@xharpism) and I went by LUSH in our local mall to return some of our old LUSH pots. If you don't know the scoop yet, bringing back 5 empty LUSH pots entitles you to get a free fresh face mask. There I was minding my own business and getting my fresh face mask and low, and behold, Sharmaine has dragged me into a blogger and influencer adventure. LUSH of Newport Mall, Jersey was kind enough to let us freely browse into the shop and take photos. Sharmaine even went home with a lot of skin care samples to blog about. So let's talk a little about my LUSH favorites. There's three things I keep repurchasing at LUSH and that is the Roots Hair Treatment, Breath of Fresh Air Toner and Bubblegum Lip Scrub. Of course I have tried the other LUSH products as well but these are my absolute faves. You know, there are just some things you can't let go and replace. 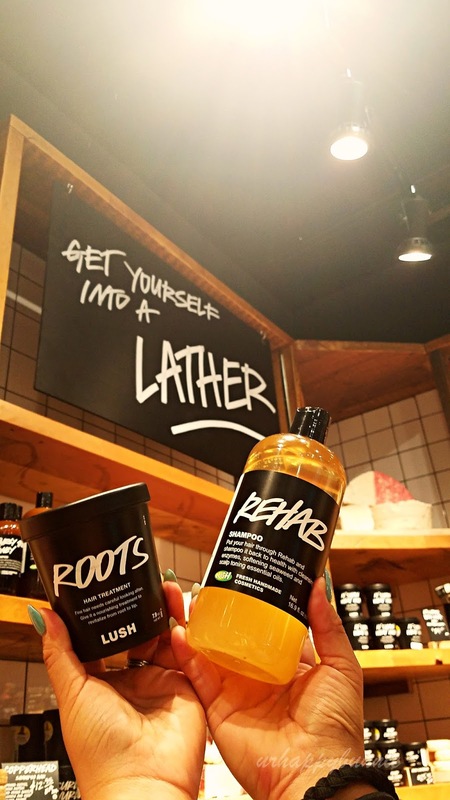 LUSH believes that healthy hair starts at the Roots and it's true. If you have healthy and well nourished scalp, hair grows healthily, stronger and faster. Of course, if you have dead ends, there is no other way than to snip those off. 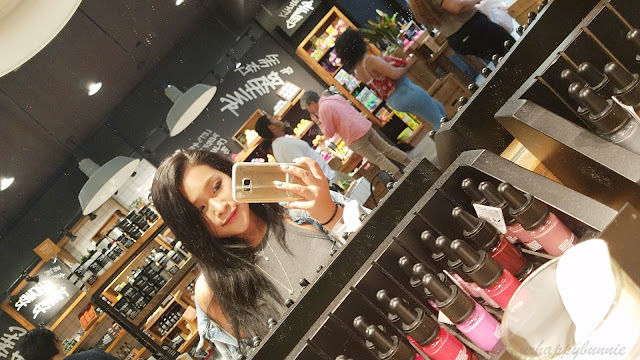 I have blogged about Roots a couple of times the first one dated back 2014 when I had really long hair, and again in 2015 when I drastically cut my hair short (Summer 2014: Hair Care Routine, 2015 Hair Update). I have a been a big fan of this product hence the constant repurchasing. It has saved my scalp from sebaceous dermatitis (dandruff) whenever they get really dry and itchy. Since we are on the topic of hair care, let me just quickly give a shout out to another LUSH love of mine, the Rehab shampoo. Rehab is a clarifying shampoo that deeply removes dirt and oil on your scalp. When Roots and Rehab are used together they are a perfect combination! Put your hair into rehab and nurse it back into health as what the bottle says! Here's a photo of Sharmaine and I with our Lush faves. My other fave is the Breath of Fresh Air Toner. There's a few ways you can go about with this toner because it's multi use. After skin cleaning, you can spritz this directly on your face to balance the skin, or you can use it with a cotton pad to remove left over dirt and makeup. Another way I like to use this toner is spritzing it on my face during an extremely hot day. And yes, you can spray it even on top of your makeup! Just don't drench your entire face with too much. Breath of Fresh Air calms, cools, soothes and rehydrates skin and is formulated with sea water, aloe vera gel, rosemary oil, patchouli oil and other natural ingredients. And my last favorite is the Bubblegum Lip Scrub which I have mentioned in my Summer 2017: Night Time Beauty Routine. We obviously don't like dry and chapped lips so a lip scrub is the way to go to remove those dead skin. The LUSH Bubblegum lip scrub smells so good and since it's vegan and organic feel free to give it a lick while you're scrubbing and no harm will be done. 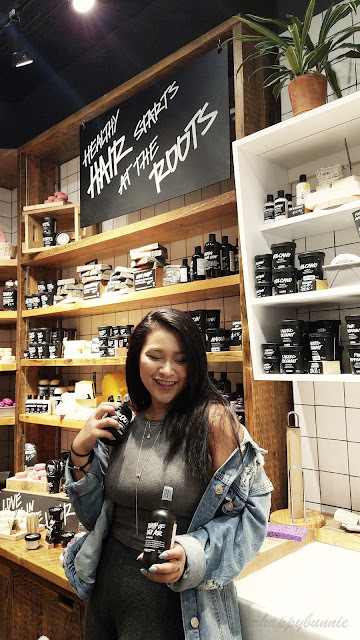 Having featured our favorite products in the photos, LUSH Newport Mall also allowed us to try on the Knot Wrap. The Knot Wrap is made from either organic cotton or recycled plastic bottles. If you're buying LUSH products as gifts, I highly recommend purchasing and using Knot Wrap to wrap your gifts. It does not only make your gift pretty and unique, the Knot Wraps are also reusable. You can use it as a scarf, a headband, turban, a tote, a towel, to wrap another gift, and all sorts of stuff! It's not only eco-friendly, it also gives back to the community as I was informed, these wraps are made by women in Africa. Being a makeup enthusiast as well, I couldn't help but take a photo of their makeup display. 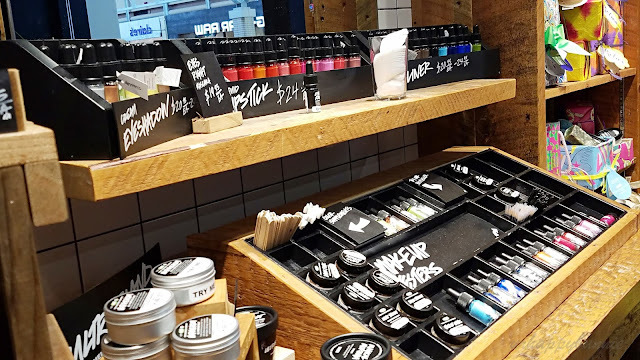 Again, all LUSH products are vegan and cruelty free. And I also couldn't resist a selfie at the store. ^^ The mirror lighting is awesome! Drop by your local LUSH store and try on my faves. If you reside in Jersey City, head over to Newport Mall (30 Mall Dr W, Jersey City, NJ 07310).